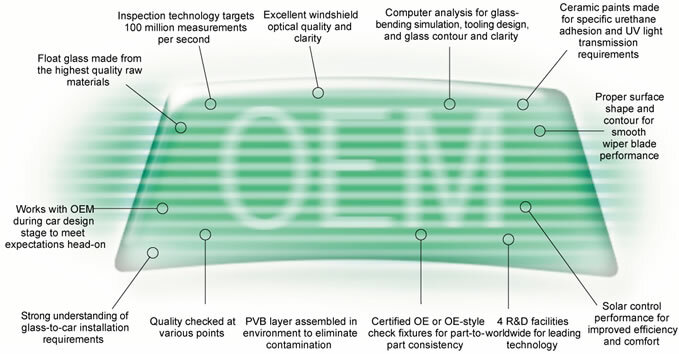 Original Equipment Manufacturer (OEM) glass. Dealer glass is purchased directly from the auto dealership authorized by the vehicle manufacturer to service your vehicle. This glass is from the same original equipment manufacturer (OEM) that made the glass in your car when it was new. OEM, or Original Equipment Manufacturer, means the parts are certified to be genuine manufacturer parts. Like dealer glass, OEM glass will be the same as what came out of your vehicle. Replacing glass with another brand makes no difference at all. Collector cars may want OEM parts to retain the originality of the vehicle, for the rest of us all glass is AS-1 certified and is guaranteed to fit correctly every time. Aftermarket glass is manufactured by companies that contract directly with car manufacturers. As such, aftermarket glass is made to the exact same specifications as OEM or dealer glass but is considered to be “original equipment equivalent.” Although it is significantly less expensive, aftermarket glass is typically the same thickness from the original glass in your automobile and carries the same guarantee as OEM or dealer glass.